Republished from the Ukrainian on-line journal Nihilist. In our previous article, we began discussing Western political forces sympathizing with Putin’s Russia and overtly supporting its policies. Now, when relations between the Russian Federation and Western countries have deteriorated as a result of the annexation of Crimea and the military affair in eastern Ukraine, these forces are manifesting themselves particularly vividly. Putin’s actions have become impossible not to notice or ignore. The war in Ukraine has virtually eliminated moderate and neutral stances – the Russian regime is either criticized or overtly supported and vindicated. And while the “Russophilia” of many parties and movements was unnoticeable earlier, they are now forced to articulate it more clearly. Until now, we talked about organizations and parties which identified as left-wing. They maintain a pro-Putin stance, seeing in modern Russia a counterweight to what in their view is the main enemy – the West, and, first and foremost, American imperialism. To them, support for Russia is a natural continuation of support for the USSR; it is as if the neo-Stalinists have returned to the simpler and clearer times of the Cold War, when they had a large and powerful friend in the east who kept in check the military and economic expansion of the United States and Europe. But Putin’s regime does not limit itself to betting on Western leftists; furthermore, it does not consider them his its main foreign-political allies. You will not hear anticapitalist rhetoric in speeches by Russian politicians and diplomats. Putin does not question the institutions of private property and wage labor. Even the economic policy conducted by the Russian Federation is far from socialism even in its statist form, just as it is far from moderate social democracy. In a way, “decommunization,” if by that we understand not the destruction of monuments and mosaics but the dismantling of the elements of the welfare state left over from the Soviet times, was conducted much more effectively than in Ukraine: We are talking about monetization of social benefits, healthcare reform, and amendments to the labor code benefiting the employer. True, Russia has happily preserved and augmented Soviet methods of conducting domestic and foreign policy, while the judicial and penitentiary system is striving to return to its Stalinist roots. But if we look at the economy, it becomes clear that even moderate leftist values such as universal education and healthcare, strong trade unions, and protection of employee rights are alien to Putin’s regime. Telling in this context is the story of actor Depardieu who left France for Russia a few years ago in order to escape the excessively high, in his view, “socialist” taxes on the rich (eventually, however, he moved to Belgium – even low taxes were not enough to force him to play the role of “Kadyrov’s friend” convincingly enough). Russia’s political line becomes clearer if we account for the fact that Ivan Ilyin, a conservative philosopher and a sympathizer of Franco and Salazar, is Putin’s favorite philosopher. Initially, Ilyin even had positive things to say about Hitler, having seen in him a “shield against the Bolshevik threat.” Thus, a strong corporate state, where class divisions and hierarchy are preserved, big business and the state apparatus are merged into one, and the official ideology is mixed with clericalism and traditional values, is the official political ideal of the current Russian regime. Even “antifascism,” which has become the calling card of Kremlin propaganda, is largely a result of “work on mistakes” which Ivan Ilyin conducted in his 1948 essay “On Fascism.” In short, Ilyin criticized the fascists for their excessive totalitarianism (he thought they could have limited themselves to authoritarian rule), economic control bordering on socialism, insufficient religiosity, and excessive belligerence. As we can see, Putin has quietly begun to break the covenants of his own idol, but is still trying to balance on the edge; he wants to be Franco without migrating down to Hitler. Ilyin wrote that “to raise everyone against one’s own people is to destroy it.” All the while making enemies in leaps and bounds, the Russian leadership is also trying to find friends. And, naturally, it is making its stake on ideologically congenial, nationalist, and conservative forces. The so-called “Euroskeptics” have stepped forth as Russia’s principal allies. It is a broad spectrum of forces united solely by sharp criticism and rejection of the European Union. Belonging to this camp are both “left-wing” and “right-wing” parties, albeit under different slogans. The “leftists” criticize Europe for its isolation from the rest of the world, the closed nature of its borders, racism, and exploitation of poor countries. Admittedly, the sincerity of many of them is questionable: such parties as Die Linke or Syriza have not uttered a single word of support for the imposition of a visa-free regime with Ukraine; on the contrary, they are preventing Ukraine’s integration into the European community in every possible way. Although it would seem that opening Europe to 40 million people is a step, however small, toward the idea of a “world without borders.” The right, on the other hand, criticizes Europe for its superfluous openness, “multiculturalism,” godlessness, and loss of a moral compass. And, within the framework of this paradigm, the reluctance toward Ukraine’s rapprochement with the EU is in fact absolutely logical: On the one hand, it implies defense of the Old World from the invasion of “Slavic barbarians;” on the other, it is an attempt to save in Ukraine the still-glimmering “moral and religious values” from the destructive breath of the “Eurosodom.” That is precisely why I often put the word “left” in quotes, whereas I sometimes use the word “right” without them. While right-wing Euroskeptics are honest in their paradigm, the “leftists” constantly contradict their self-professed values. Regrettably, such politicians as Vitrenko, Symonenko, and Zyuganov, who decorate with left-wing slogans their cooperation with conservative and sometimes ultra-right forces, are not at all a purely post-Soviet phenomenon. Their counterparts can be seen across the entire world. Within the Euroskeptic camp, it is worth singling out France’s National Front — a prominent ultra-right party and a former favorite target for Charlie Hebdo. It has often been accused of racism and antisemitism, including Holocaust denial, but the party is now trying to acquire a more respectable image, which led to a conflict between its founder (Jean-Marie Le Pen) and his daughter (Marie Le Pen). There was a well-known story concerning the party leadership’s reception of a large and extremely advantageous loan from a Russian bank. Many considered this a thinly-veiled bribe. National Front is one of Putin’s main mouthpieces in the West and within the European Parliament. Another important ally is the Hungarian Movement for a Better Hungary. Its name Jobbik has become common and is used to depict a caricature of a right-wing radical ascending to power. Jobbik is an important ally for Russia, also with regard to the Ukrainian issue, as a potential source of separatist threat in Transcarpathia. Greece’s Golden Dawn has completely lost relevance following its political defeat and the assumption of power by Syriza, although at the official level, contact with it is maintained (more on this below). The same can be said of the German NPD, which is on the edge of being banned and with whom unofficial work is conducted. The AfD (Alternative for Germany), on the other hand, the new German right-wing populists who are trying to escape association with the Nazi legacy and the subculture of Nazi skinheads, are sufficiently “respectable” ultra-right partners for the Putin regime with whom contact is not restricted. Among the European-Parliamentary ultra-rightists, it is worth singling out parties comprising the Europe of Nations and Freedoms coalition. It includes members from the aforementioned French Front National, two “Freedom Parties” from Austria and the Netherlands, Belgium’s Flemish Interest, Italy’s Lega Nord, Poland’s New Right Congress, and a lone British right-wing radical who has broken off from her old party [Janice Atkinson, UK Independence Party]. 25 members from seven countries provide the far-right faction with additional weight in the European Parliament, but they do not make it a significant force. Among the aforementioned forces, the most interesting to us is Lega Nord, a distinct kind of Italian “separatists” advocating the secession of a number of provinces. However, they thought better of secession upon receiving ministerial posts in the Berlusconi government. Among their notable ideas is the proposal to allow border guards to shoot boats transporting immigrants. Lega Nord actively advocates the repealing of sanctions against Russia, and its leaders have gone on friendly visits to both Russia and the occupied territories. Although the Alliance of European National Movements (in which the Ukrainian Svoboda party was granted observer status but eventually cancelled its membership) does not have a sufficient number of members for registration as a faction in the European Parliament, it has united around itself some very vivid representatives of the ultra-right component of the political spectrum: Hungary’s Jobbik and Bulgaria’s Ataka. In the past, it had also included Marie Le Pen from the National Front, but she left the Alliance in 2011 in order to escape identification with very radical neo-Nazis and antisemities. However, they did meet on the same side of the barricade, already as supporters of “Novorossiya” – Alliance leader Bela Kovacs attended the “referendum” in Donetsk as an observer. However, politics is conducted not only in parliaments – far more interesting and important events take place in the streets. Russia also has its supporters in the non-parliamentary sphere. First of all, it is worth mentioning the far-right PEGIDA movement (Patriotic Europeans Against the Islamization of the West), which holds quite large meetings in Germany and is quietly exported to other EU countries. In Germany, a one-thousand-strong march of ultra-rightists is quite an astonishing event. Parties like the NPD or AfD have never managed to muster anything to that tune: Only efforts by the police managed to protect them from radical leftists. But PEGIDA succeeded where others had failed for years – they have managed to consolidate their presence in the streets. The movement is very variegated. Despite their identification as “anti-Islamists,” PEGIDA is more of an umbrella movement for right-wing groups of great variety; to some of them, anti-Americanism and antisemitism is more important than opposition to Islam. At major PEGIDA meetings, one can notice both Israeli flags (Israel is seen as an “outpost” against Islamization) and antisemitic propaganda of the lowest and cheapest kind. The movement’s members with more simplistic views see the root of all evil in immigrants and their religion. PEGIDA members who go deeper into conspiracy theories blame everything on the United States and plotters who are deliberately trying to populate Europe with Muslims and root out its indigenous population. It is the professors of this position who are most often friends of Russia. The “Monday demonstration” movement has become a regular point of interest for German pro-Russian activists of all coats. A mixed attendance ranging from a few tens to a few hundred people meets every Monday in order to advocate peace. Flags depicting doves and pacifist rainbow flags (not to be confused with LGBT symbols; the pacifist rainbow consists of seven colors and is actively used in Europe) fly alongside St George’s ribbons and flags of Russia and the LNR [Luhans’ka People’s Republic] and DNR [Donets’ka People’s Republic]. Statements about the predominance of financial capital, imperialists, and the urgency of rebellion are diluted with kind-hearted Philistine calls for “world peace and love,” and wild conspiracy theories are alternated with soft music. The magazine Compact is an important force setting the ideological tone for these events. A publication which, according to its editor Jurgen Elsasser, is “an attempt at establishing a dialogue between the left and the right.” However, even among the pro-Putin German left (more on this in the previous article), direct cooperation with Elsasser is considered a sign of extreme grubbiness. The ultra-right is less squeamish – contacts with Compact are maintained by PEGIDA, ultra-right football hooligans, and even traditional right-wing parties. Simultaneously, Elsasser actively establishes contacts with Russian politicians. He maintains contact with Aleksandr Dugin. It is telling that Vladimir Yakunin, Putin’s trusted man and Russia’s main railway tycoon, spoke at one conference organized by the Compact magazine. That is to say, they do not limit themselves to small “Eurasianist” get-togethers – contacts with the German ultra-right scene are maintained at the very top. The international conspiracy theory network, which itself resembles a kind of secret club of conspirers, is a movement started by Lyndon LaRouche, a former Trotskyist who defected to the right. He has abandoned all of his primordial left-wing convictions bar critique of capitalism, having simultaneously the criticism of the exploitation of wage labor with criticism of the “parasitic” banking capital. It is quite a widespread trick which bridges the gap between left- and ultra-right-wing ideologies. Criticism of money, contraposition of “bad” banking capital and “good” industrial capital and, to crown all, “a conspiracy of bankers pushing the world into the abyss.” Then, one proceeds toward either direct antisemitism or a politically correct balancing act. Nataliya Vitrenko, who bears a physical resemblance to his wife Helga, is the closest Ukrainian equivalent of LaRouche. The meeting attended by Vitrenko took place under the aegis of the Schiller Institute, which is what the adepts of LaRouche’s teachings call themselves in Germany. In a way, the structure of LaRouche’s organization resembles the Scientologist sect: They are present in different countries under different names, trying to sell their ideology in different packages, including to quite influential people, and quite successfully so. At times, certain academics completely seriously compare LaRouche’s movement to a totalitarian sect. Many people like jokes about the reptilian conspiracy, but everyone knows where they came from. Reptilians are not just a joke which originated on the Internet. The movement of David Icke, a former sports commentator at the BBC, has for many years, and completely seriously, fought the invasion of extra-terrestrial lizard people who rule humanity with the help of the Illuminati. Icke also has quite a number of supporters who translate his writings to different languages and creatively develop the revelations of their teacher and prophet. We should not be surprised that David Icke has also critically supported the “rebellion in the Donbass” and condemned (sic!) Queen Elizabeth for drinking the blood of the Donbass children. The strength of conspiracy organizations and circles lies in their variety: They constantly split up because they constantly discover Freemason agents in their ranks. That is why no less than a small monograph would be necessary to enumerate all of them. I will only cite one illustrative example: The Staatenlos (Stateless) movement is an international political sect established by a former member of the NPD. The movement insists that Germany is still ruled by fascists who continue in the tradition of the Third Reich, that is why Putin must deploy troops in Germany in order to liberate it from fascists and American occupiers. This is not a joke. Every day, they keep watch near the Russian embassy and the Reichstag, scaring tourists with Russian flags and striped ribbons. After the 1917 revolution, the USSR stepped forth as propagators of the Bolshevik ideology. Today, Russia has no ideology which could be “exported,” but it is clear that they are working on finding or inventing it. One attempt to internationalize the ideas of the “Russian world” has been to put to service conservative fears, including homophobia. The Concerned Parents movement copies the slogans and rhetoric of the Parents’ Committee movement, founded in Russia with the participation of Orthodox Christian radicals. Its main goals are the liquidation of sexual education in schools and protection of children from “immoral” content on the Internet and television. However, the activity of this movement went to naught after its confrontation last winter with LGBT activists and left-wing radicals; they have since not conducted public events or asserted their presence on the Internet in any way. It is telling that a substantial contingent of Concerned Parents consisted of Russian speakers living in Germany and gobbling up tales of the Eurosodom. It is difficult to believe, but Eurosodom stories ventilated by [Kremlin propagandists Irina] Bergset, [Arkady] Mamontov, and [Dmitry] Kiselev made their way back to Europe. Following in the footsteps of Russian TV audiences, some local conservatives began adopting that “concern.” In spite of their essentially “parental” propaganda, their Internet resources have actively advertised initiatives of pro-Kremlin forces, including Compact magazine. 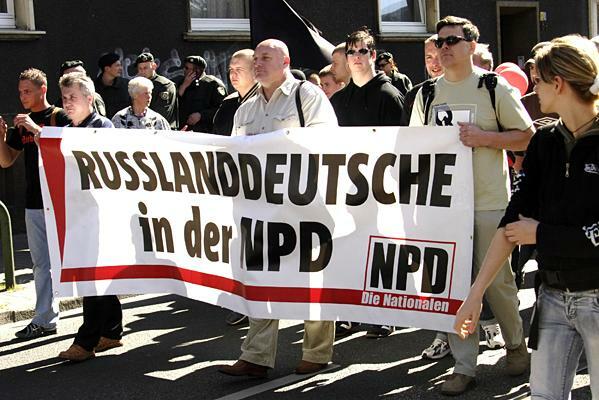 Within the NPD, Germany’s main ultra-right party which is constantly on the edge of being banned, there exists an entire movement of “Russian Germans.” It was also thanks to their efforts that the party, which had previously been on friendly terms with the Ukrainian Svoboda and maintained contacts with other right-wing Ukrainian organizations, adopted a pro-Russian stance. The fundamental values of the German neo-Nazis in the NPD and their Russian colleagues are antisemitism and anti-Americanism. Russian-speaking inhabitants of Europe are an important target audience for the propaganda of “Russian world.” It is disseminated through small newspapers intended for immigrants, websites, forums, social network groups – it is sometimes quite difficult to differentiate between professional wage-earning provocateurs and those who simply recount from the heart what they heard on television. Very demonstrative in this respect are the videos published on the Rus Berlin Youtube channel, created by a Russian-speaking native of Latvia. An entertaining resource for an extremely undemanding audience was suddenly filled with attention toward the situation in Ukraine. Attempts at rapping were replaced by profound political analysis (with headlines such as “Boris Nemtsov Is Jewish Traitor of Homeland”). The work in the information space conducted by Russia is not limited to television and Olgino bots [group of social network users paid by the Kremlin to promote Putin administration’s policy]; its propaganda tries to reach the most unexpected audiences, and such clumsy channels by amateur video bloggers are no exception. This propaganda directed at expats looks very absurd and virtually like a parody, but the size of its audience must not be underestimated; these are the same people “giving likes to [Russian social network] Odnoklassniki.ru posts” who, to a Facebook user, seem like a parallel universe. For instance, a video has hundreds of thousands of views, and the channel where it was published has 20,000 subscribers. (Short summary of video: How come Germany is not with Russia? Because the United States pays Germany, therefore Germany is not with Russia). Take a look at this double charge of stupidity and absurdity: the aforementioned video bloggers are interviewing conspiracy theorists from Staatenlos who are asking Putin to liberate Germany from fascism. No, this is not a parody or “trolling.” When you are shown reports saying that Russia enjoys support among the German public, you are actually shown precisely such characters. We saved for last every sort and kind of supporters of the sacred “Third Way,” Eurasianists, and searchers for the lost mythical tradition who, following in the footsteps of Julius Evola, are trying to “ride the tiger” [title of Evola’s book] or at least the bear, and find in Russia what in their opinion has been lost in the West. As in the case of conspiracy theorists, it is important here to talk not so much about clear-cut political forces, but about ideas and trends which regularly push their professors into the embrace of the “Russian world.” This sort of admirers of “Russia” and “Novorossiya” is most perfectly embodied by Aleksandr Dugin, who has followers in Germany, Italy, Austria, France, Hungary, and even in the United States which he curses with such fury. Aleksandr Gelevich [Dugin] was already mentioned in sufficient detail in the article about the “Red-and-Brown” 1990s, therefore we will now discuss him solely in the international context. Dugin is remarkable in that, in a way, he promulgates the ideas of right-wing mystics across the globe. The search for a lost Tradition, the struggle against the mechanical and soulless present in the name of returning to the beautiful and majestic (albeit non-existent) past are superimposed on real phenomena and trends in global politics. And it turns out that the “mystic Tradition” is to be found in Eurasia, and all evil of the modern era creeps in from the West. It is necessary to purge Eurasia of foreign influence and return to pure spiritual sources; happiness will then be restored, everyone in the world will become Russian, including animals, trees, and even rocks, and it will then be possible to form an enormous roundelay encircling the Earth, and run around in circles for Eternity, and the animals, the trees, the rocks, and even God himself will also run around in this roundelay, because God is also Russian. It is precisely for this reason that the solar Putin (according to Dugin, there are two Putins – solar and lunar, good and evil) should immediately deploy troops in Ukraine and move right up to the Atlantic Ocean, across which the Evil is hiding. Yes, these ideas, although presented in a less fervent and more pseudo-scientific fashion, indeed have thousands of supporters around the world, and we are not talking about ordinary people. These people are often activists representing extreme-right parties and organizations, and thus the contemplative struggle between the “Atlanticists” and the “Eurasianists” pours into the perfectly real stream of money and volunteers from European countries, and into the pro-Russian lobby at different levels, ranging from small political sects to parties represented in the European Parliament.